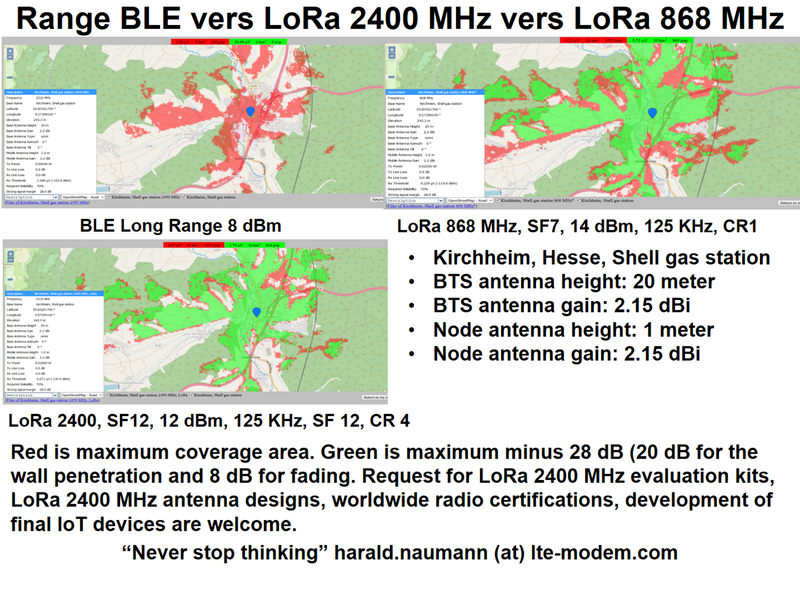 The comparison of the range of a LoRa module with 2400 MHz, Bluetooth long range modules and LoRa 868 MHz modules shows that BLE long range is not a real long range. LoRa 2400 MHz with SF12 is not much worse than LoRa 868 MHz. LoRa 2400 MHz is not subject to any duty cycle. If you use a TDMA instead of Aloha, you surely get very good results. Furthermore, with LoRa 2400 MHz it is much easier to achieve worldwide approval than with LoRa at SubGhz. Red is maximum coverage area. Green is maximum minus 28 dB (20 dB for the wall penetration and 8 dB for fading. Request for LoRa 2400 MHz evaluation kits, LoRa 2400 MHz antenna designs, worldwide radio certifications, development of final IoT devices are welcome. LoRa 868 MHz setting is the LoRaWAN EU setting. BLE Long Range is not really long range is almost no range. It is better than standard BLE but nothing compared to LoRa 2400 MHz. We have 2400 MHz Lora modules and eval kits in stock. We invested in some interesting antenna shapes and tested it already. Touch the future now. Touch it with us together.